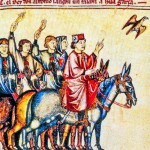 In his the prologue to his Libro de los juegos (Book of Games) Alfonso explains that because God wished people to be happy, and to have a means of overcoming their troubles and cares, they invented a variety of games. The animal tales called Kalila wa Dimna (Kalila and Dimna) had originated in India in the third century, later passing into Persian and Arabic, and were translated into Hebrew, Latin, and Castilian Spanish in the thirteenth century. The infante Felipe (born in 1231) was one of Alfonso’s younger brothers. Fragments of the prince’s cape survive both in the Metropolitan Museum of New York and in the Museo Arqueológico Nacional, in Madrid. The Cantigas de Santa María (Songs of Holy Mary) are a cycle of four hundred and nineteen songs of devotion to the Virgin, written between the 1260s and 1280s, in the lyric language of Galician-Portuguese. Hunting occupied a central place in Alfonso’s world: for most medieval people, it was a vital source of food, but for the social elite it was also a status symbol. Alfonso’s fascination with the stars followed the model of earlier Muslim-Spanish rulers; in the eleventh century, the kingdom of Toledo had been a hub of medieval science.